Marketa watched through the window as snowflakes swirled around the approaching couple. 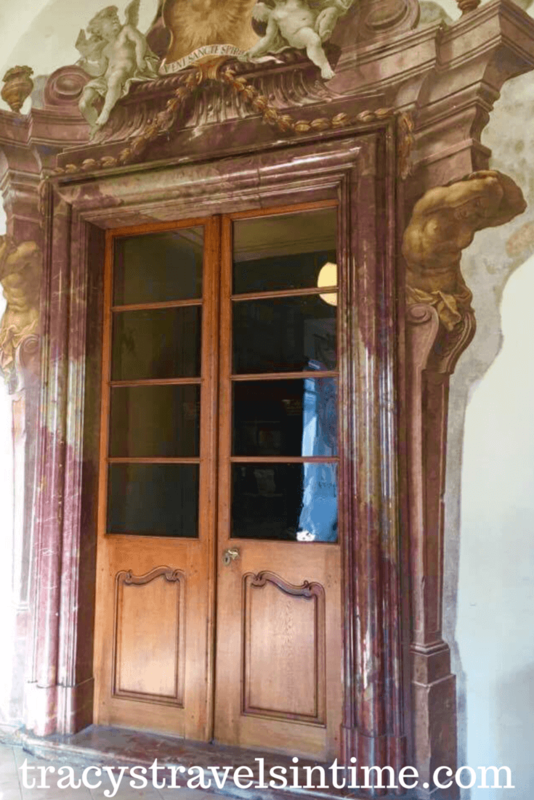 As they pushed open the old wooden door the duo were met with the stares of twenty pairs of unblinking eyes, each seemingly imploring them to enter quickly and shut out the icy breeze which was their uninvited companion. They waved their tickets vaguely in the air at both no-one and everyone and joined the others in the hallway. No more eye contact. They all stood, each in their own comfort zone, whispering to partners or friends and waited. Time to go. The numbers were right and everyone accounted for. Marketa knew what was coming. She stepped into the middle of the room and introduced herself – she had been a guide for just 6 months and she loved her job. Three flights of stairs first. Windy, metal staircases that twisted round and round. She paused at the top to let the dizzy and breathless rest and catch their breath and gaze admiringly at the artefacts and pictures around them. Men who had lived hundreds of years ago but whose discoveries reached across time. But it wasn’t enough. The best was to come. She ushered them into the next room to face two large doors. The doors were ornate and inlaid with glass panels. They stood like gatekeepers to a different age and beyond them the darkness was impenetrable. But not for long. The group gathered around the doors trying to peer in. They looked to Marketa with uncertainty – was this it? She smiled, nodded and opened the doors allowing the group to move slowly into the room. Smell was the first sense to time-travel. Of paper, ink, and books that had been painstakingly catalogued and arranged and not been moved for centuries. The very air seemed ancient as if it was trapped in the room and now belonged there. Then vision. She gradually turned on the lights, slowly bringing the past into the present. There was a collective gasp and then silence. She let them take in the scene before them – a Baroque library of such immense beauty that it took your breath away and overwhelmed the senses. The bookcases were divided by ornate gilded columns and books stood like signposts to the past on shelf upon shelf. The ceiling was painted with Renaissance style frescoes depicting the themes of science and art. And there in the middle of the room stood the globes. Globes that depicted a world that existed then but not now – and spoke of men on the brink of discoveries. She let them time travel though history. But soon it was time- time to bring them back. Here and now. She knew that their lives would be forever touched by a glimpse into the beauty of the past. They said thank-you and left – back into the beautiful snow covered city of Prague. But something had changed. The past had reached across the centuries and left its mark. She smiled and turned – another group waited. 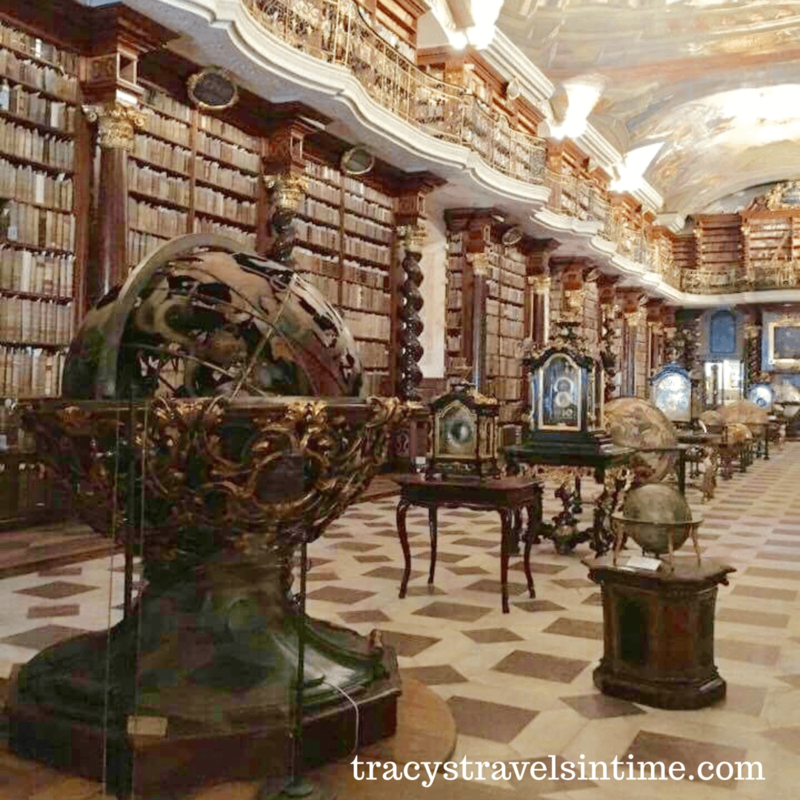 The story is based on our visit to the Baroque library hall in the Klementinum which is in Prague in the Czech Republic. 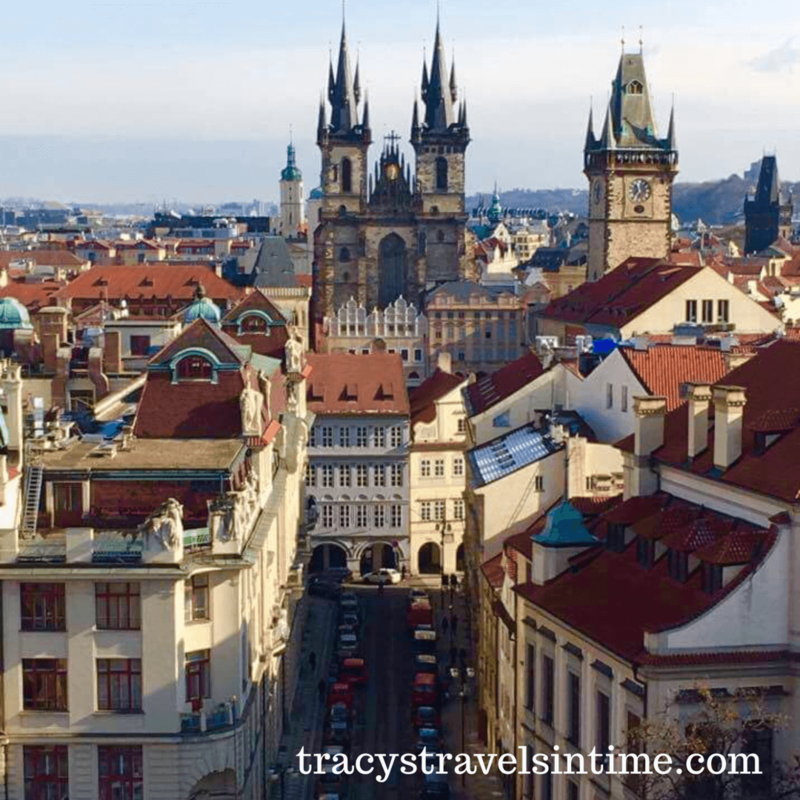 It is situated next to the Charles Bridge and is one of the largest building complexes in Europe. The Baroque library hall was first opened in 1722 and the books, the globes and the frescoes will I guarantee take your breath away! The Baroque library is just one of the attractions in the Klementinum – the Astronomical Tower gives wonderful views of Prague. Wow-that is so beautiful! Have you written anything else in this style? I’d love to read it! Not yet but I have a few ideas. 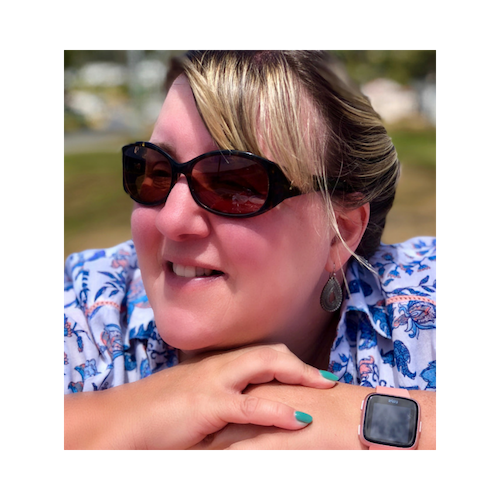 This was easy to write – Marketa made such an impression that I had to create the story from her point of view. Really well written! Love it! 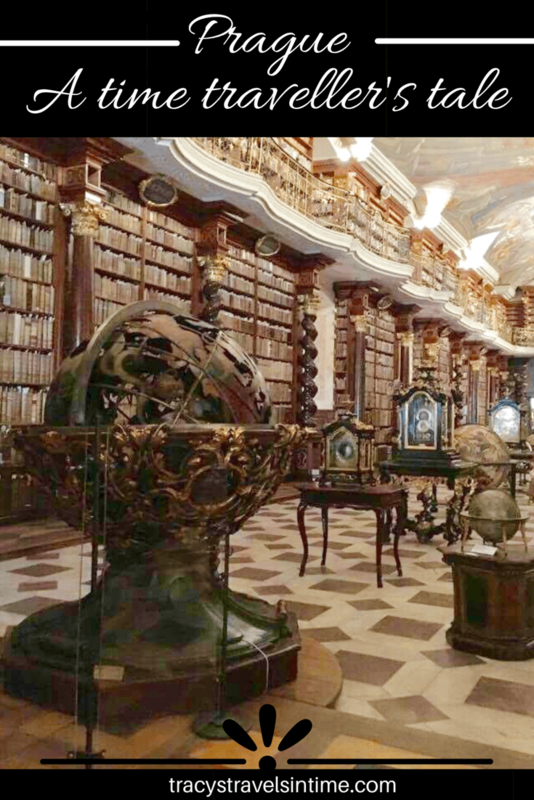 I’ll have to go back to Prague to see this library – you got me intrigued! Thank you! It is a beautiful library – i really felt like i had stepped into the past. Shame that you didn’t win the Travel Writer’s competition, as that was really good read. I love library’s and this one has definitely being added to my list. Thank you – I am glad you enjoyed it ? All I can say is the winner must have been flippin’ good! Probably amazing! I will keep trying! I did enjoy writing this. ? Thank-you David. The reviews were a bit hit and miss but we loved it – i think we were very lucky to have the guide we had as she was superb. I was so pleased we went as the reviews weren’t good but it was truly amazing! Thanks Kana – it really is a special place! It is an experience Chloe – it just took my breath away its so stunning! Oh, my librarian heart sings! All those books, all those stories, all that history! A dream visit, for sure. OOooooo thanks will check them out! I hope you enjoy it as much as I did – such a beautiful place! I loved this post. 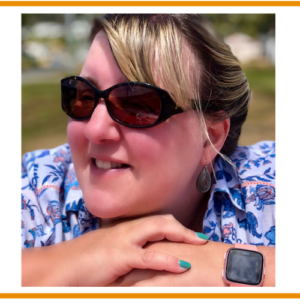 You are an incredible writer – I felt like I was there! Beautifully written! you are so clever! We’ve been to Prague but missed out on this library, will definitely visit on our next trip. Thanks 🙂 It was amazing! Great story, atmospheric and well written. Keep trying for the competitions! Amazing! 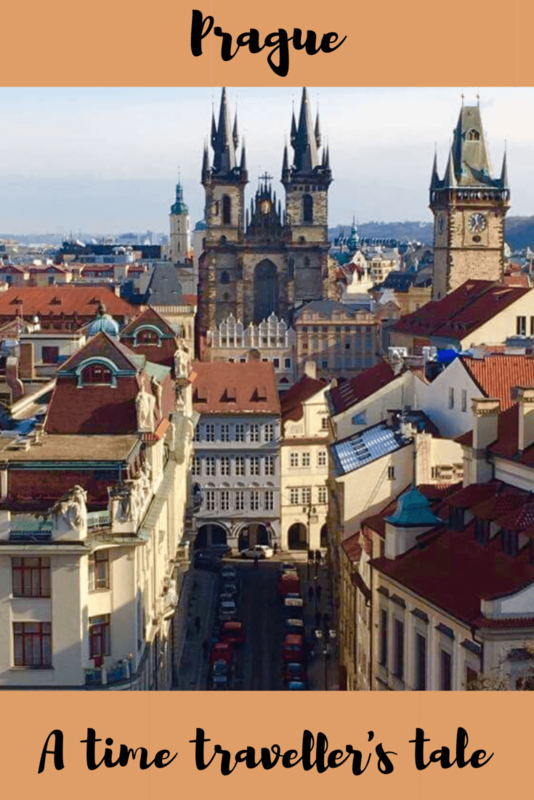 Prague is on our list for 2018! Love the way you have written this post. The library is simply gorgeous. 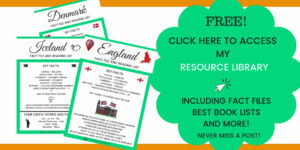 Must see for bookworms like us! Such a great visual! I could really picture the library and all of the sights and smells. Loved it!